Is Vicodin Safe While Pregnant and Breastfeeding? Generic Name: Hydrocodone and Acetaminophen. Summary Recommendations: Vicodin is prescribed for relief of moderate to severe pain. 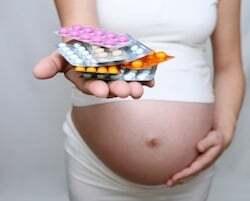 The drug can be used during pregnancy when the benefits outweigh the risks, but it is important to contact your prescribing physician or gynecologist as soon as you find out you are pregnant. General Precautions: Vicodin is a narcotic pain reliever. As such, there is an increased risk of addiction in patients with a history of addiction. Vicodin should never be taken in combination with alcohol or medications that affect liver function as the acetaminophen in Vicodin may increase the risk of liver damage. Patients with a history of liver disease, especially liver disease associated with alcohol intake, should not take Vicodin. Taking more than the prescribed amount of Vicodin can lead to liver failure and death. Never take more than the prescribed amount. With long-term use, Vicodin may eventually become less effective at reducing pain. If your pain returns or the medication does not appear to be working as well as when you first started taking Vicodin, contact your physician as your prescription may need to be changed to another medication. Vicodin contains acetaminophen, which means patients should not take medications containing acetaminophen while taking Vicodin. This includes medications for cold, flu and other illness. Always check the medical label for acetaminophen. Patients with asthma, breathing disorders, hypotension, stomach problems, hypoactive thyroid, mental illness or history of addiction should not take Vicodin. Common side effects reported in patients taking Vicodin include dizziness, constipation, blurry vision, dry mouth, and mood changes. More severe side effects may include seizures, jaundice, confusion, difficulty urinating and unusual behavior. If you are having side effects to Vicodin, report the side effects to your physician immediately. Effect While Trying to Conceive: There have been no animal or human studies on the effect of Vicodin on fertility. Effects on Pregnancy: Controlled studies on the impact of Vicodin on pregnancy have not been completed. Infants born to mothers taking Vicodin have suffered dependency. Infants born physically dependent on Vicodin suffer withdrawal symptoms including increased crying, overactive reflexes, tremors, and fever. Safe During Breastfeeding: While acetaminophen is generally considered safe while breastfeeding, hydrocodone is a narcotic that passes to infants in breast milk. Increased infant drowsiness is the most common side effect reported by mothers taking Vicodin while breastfeeding. It is suggested that Vicodin intake while breastfeeding be limited to 30 mg per day. Infants should be monitored closely for increased drowsiness, delayed developmental milestones and limpness.